As a blogger for years, I’ve experimented with multiple types of blog promotion. To this day, though, one of the most effective promotional platforms for me, continues to be social media. 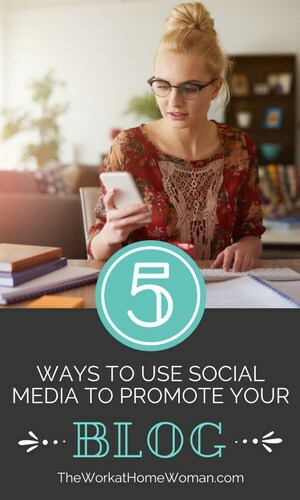 In this blog post, I’m going to share my top five tips to use social media to promote your blog. 1. First things first: Grow your social media profile. Before you can truly start to promote your blog, you need to build your social media profiles. First, choose the social networks you want to use for blog promotion. Ideally, you should stick to what you have the time to handle, to get the best possible results. If you stretch yourself too thin, you might not be able to keep up with all of your different profiles and end up not getting many results from either one of them. Once you’ve established your preferred social networks, you need to be as active as possible and engage with other people on a daily basis. The more you engage, the easier and faster it is to grow your profile and get more followers, more shares, clicks, and ultimately, traffic. You also need to share content that is of value to your audience – not just yours, but also from thought leaders and influencers in your niche. As you do these things, you will not only grow your profile, but it will also help build up your authority and credibility on social media, which will help get you more results in the long run. 2. How to share: Use hashtags and visual content. As you start sharing your blog posts with your social media audience, you can’t just write a short headline or introduction to the post, along with the link. This won’t attract much attention to it, which means there will be little traffic in return. Rather, try to make your posts more visible with hashtags (this is particularly useful for Twitter, as Facebook users are not as keen on hashtags). Try to use one or two (no more than two, though!) hashtags per tweet. Make sure that they’re not only relevant to the blog post in question, but that they are also actively used by others. You can use a tool like Hashtagify to research popular hashtags and to find out if your choice hashtag is popular enough to be used and if there are any other related ones that you can include as well. Where possible, you should also try to use trending hashtags. Although these hashtags’ popularity doesn’t last long, it can still help boost your visibility and traffic for a few hours. Alternatively, you can also try to use popular weekly hashtags like #wednesdaywisdom or #fridayfeeling. These hashtags typically stay trending for the entire day, every week. Next, you should also consider using visual content as often as possible when sharing your blog posts on social media. Visual content tends to drive a lot more engagement than text-only updates, and that happens on most major social networks. More engagement means more shares, more clicks, and subsequently, more traffic to your blog. Try to experiment with different types of images to see which ones drive the most engagement. In some cases, it can be that just the image itself drives lots of shares, for example, if it’s particularly beautiful or funny. 3. Use social influencers to help promote your content. Social media influencers have a lot of power and influence over their audiences, and because there are so many of them, this has led to a huge rise in influencer marketing in recent years. Another reason for its popularity? Well, it’s simple, really: It works. Connecting with influencers and having their support on social media can help build your profile, generate more engagement, and get you more traffic. To connect with social influencers via social media, you need to find them first. You can use a tool like Agorapulse to identify influencers that are following you and something like Buzzsumo to search for influencers in your niche. Next, it’s a question of trying to connect with them and build a relationship, which, while it can take some time, it will be very beneficial in the long run. Follow them on social media and their blog, share their content, take part in Twitter Chats with them and other online events, join the same groups and, most importantly, try to engage as much as possible with them. Another useful thing to do is to mention them or link to their content in your own. Then, let them know about it; if your post is good and provides value, you’re much more likely to get a share from them. 4. Make the most out of your brand advocates. You can also use your fans to help promote your blog on social media. As you grow your following on both social media and your blog, you are also more likely to get some brand advocates in the mix. Brand advocates are those people who love your content and your blog and are often sharing with their audience. These are extremely valuable assets to have, and the more you nurture them, the better. Keep an eye out for any users who you keep noticing sharing your blog posts, or retweeting your posts – these are your brand advocates. You can also use a tool (the aforementioned Agorapulse does this) to identify any brand advocates on your list. Once they've been identified, make sure to show your appreciation for their support in some way. Start by thanking them for their shares and by engaging with them as much as possible. The more you do, the more your relationship with them will grow, and they are more likely to become even more active sharers and supporters of your blog. To take things to the next level, you can even give them a gift of some kind, such as something that you’re selling on your website. 5. Use groups and communities to promote your content. Social media groups and communities can help bring in a lot of traffic to your blog. Start by joining relevant groups on different social networks (such as on LinkedIn, Facebook or Google+) and engaging with other users until you build up your authority among the other members. Then, start sharing links to your blog posts only where they’re truly relevant to the conversation. You can’t just join a group and start posting links; that won’t work, and it will even probably get you kicked out of the group. Rather, focus on building your reputation in the group first, and then keep it by only sharing valuable content, at the right time. Social media can be a powerful source of traffic for bloggers when used correctly. What are some of the ways you’re using social media for blog promotion? What social networks are bringing you the most traffic? Hi, started my blog 5 months ago and have been promoting it on Instagram,facebook and Twitter. But traffic to my blog have been very discouraging, although I try to encourage myself and keep posting. I will definitely follow up on your advice to boost traffic to my sight. Social media is a great way to get traffic to your blog, but I highly recommend email marketing, push notifications, and guest blogging. You need to diversify your traffic streams. Very informative post-Lilach. I always use social media to promote my blog content. Content plays the most crucial part of my post. The use of the hashtag and visual representations are very good initiative. I use the same for my post. I not only use an image, sometimes I prefer to use video on my blog. I strongly focus on community build up. It helps to build a strong audience engagement which helps to interact with my audiences. Feedback is a very important factor which works very effectively to generate a blog post which is demanding. Glad you enjoyed the social media tips, Mike. I know a lot of people who have had success with groups. Glad you enjoyed the tips, Demetria. Great tips Lilach! I’m passing this along for sure. Have a great day and weekend ladies! I’ve noticed since I started using hashtags on Twitter — that my Twitter traffic has gone up significantly. Glad you enjoyed the tips, Cori.